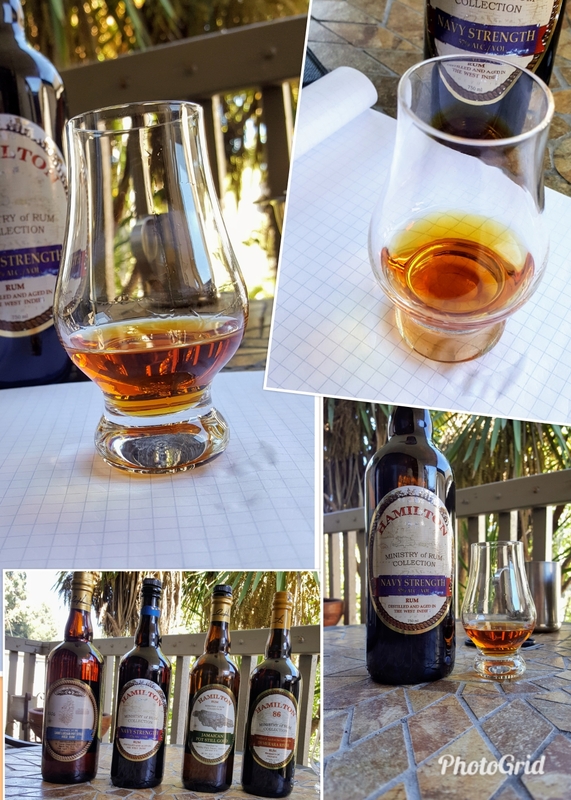 I first encountered Hamilton rums late in 2016 when I tried the Saint Lucian 2006, an ester fueled funky rum in the Jamaican style. Since that time I’ve found and tried three others, the ’86, the Pot Still Gold, and now this latest and best of all by far the Navy Strength. 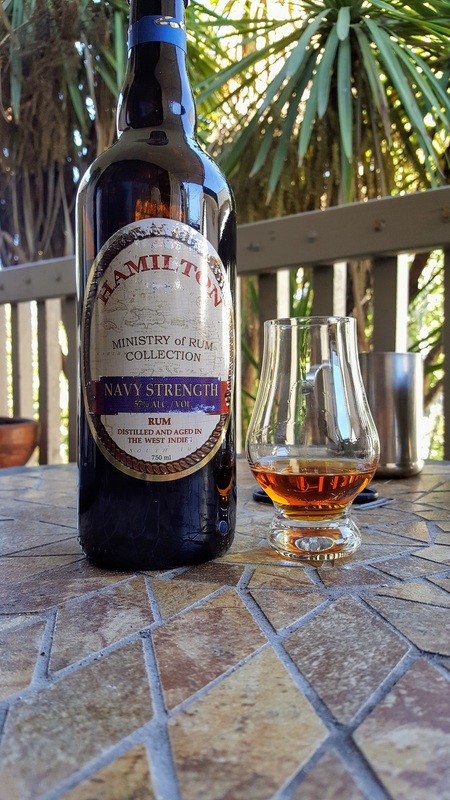 At 57% ABV this is a true “navy strength” rum. This phrase comes from the fact that at 56% and above, a gun powder wet with a little rum will still light (it doesn’t explode, but burns something like a sparkler) while below 56% it will not. Given this much alcohol (and I am assuming there is no added sugar here, an implicit promise of the Hamilton line) I expect some heat. I was not disappointed. This from the Ministry of Rum website and here is a direct link to the page on this rum. There is a lot of information there about the history of this blend. Would love to do what Ed Hamilton does! Color: Medium dark, copper red. Legs: A few fast thin legs, and a lot of slow thick drops suggests a creamy experience. Aroma: Dark fruit, prune, raisin, apricot, alcohol, molasses, oak, and burnt caramel (treacle). Sipping: Lots of heat from the beginning to a long smooth and sweet finish. 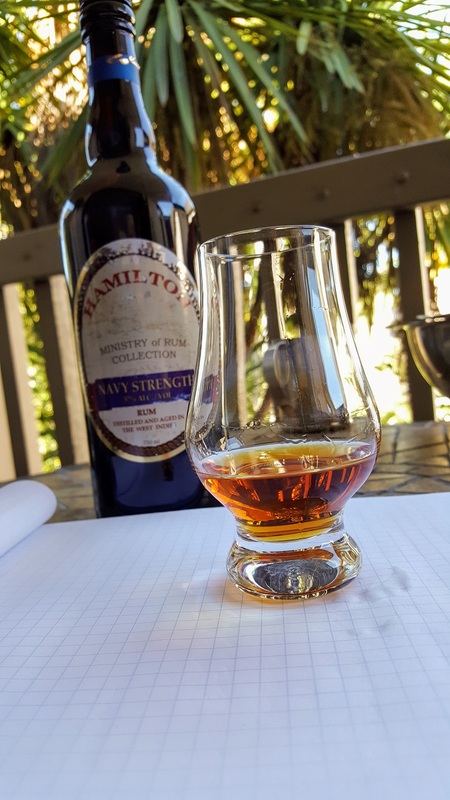 You get the dark fruit, molasses, burnt brown sugar, strong sherry notes, oak. Very creamy. I put a little water in this (1/4 t-spoon in a dram lowers the ABV from 57% to 55%, not very much) and it stands up well to it. The heat is a little reduced, bringing out coffee and chocolate notes from the rum while all the dark fruit remains. The heat is still there is a little reduced and the rum gets even creamier. The treacle turns into a less burnt brown sugar. At around $44 this rum is on the expensive side for me, but only one of the Hamiltons I’ve tried (the ’86 at $24) is under $40 anyway. This is a superb rum. Think of Foursquare 2004 (for heat) with the rich flavors of their Port Cask, and more of them. If you like the higher ABV rums, this is one to try, the richest, thickest rum I’ve had with an ABV above the 40s. As far as I know, the Hamilton rums are available only in the U.S. Considering how many great rums we cannot get here are available to Europeans, it’s good to have a line like this on my side of the Atlantic. Pairing with cigars? Of course! This rum works best with the less sweet cigars bringing out nutty brown sugar sweetness in the smoke. Highly recommended.